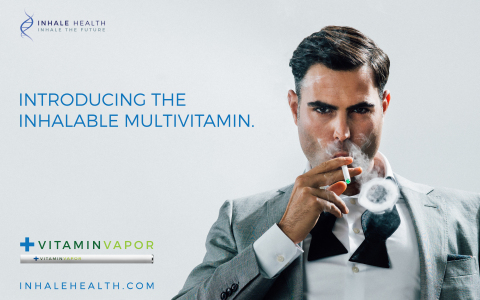 BEVERLY HILLS, Calif.--(BUSINESS WIRE)--Inhale Health, a biotech company based in Beverly Hills, CA, announced the release of VitaminVapor™, a lab verified inhalable multivitamin that delivers four essential B vitamins directly to the bloodstream through a nutrient-rich vapor that is inhaled. An innovative method, VitaminVapor™ is engineered to deliver a higher absorption rate than the low absorption levels of vitamin uptake from oral supplements in pill form as noted by the National Institute of Health. Consisting of USP pharmaceutical grade vitamins (B1, B2, B6, B12), the liquid vitamin formula is transitioned to a nutrient-rich vapor by a proprietary technology and then inhaled into the respiratory system. The four B vitamins were chosen for their synergistic impact. Vitamin B1 and vitamin B2 work in tandem to support the immune system, metabolism and natural cellular processes. Vitamin B12 and vitamin B6 increase natural energy production and support brain function. "Right now all of the inhalable products we have as a society force people to inhale toxins. This is entirely unnecessary; inhalation can be used to administer positive substances. In the future humanity will inhale things that accelerate health. At Inhale Health, we are building that future,” said Daniel Wolf, Founder & CEO. The VitaminVapor™ liquid vitamin formula is manufactured in the USA, and is intended to empower healthy habits through a toxin-free product. The vitamins are suspended in an organic base of vegetable glycerin and the formula does not contain nicotine or other additives. It’s impossible to ingest too many vitamins from VitaminVapor since the four vitamins included have no daily maximums. "Our preliminary clinical trials proved rapid vitamin uptake through inhalation. We've proved B12 absorption through inhalation is more efficient than conventionally administered oral supplements. We have just begun to scratch the surface,” said Mario Danek, Director of Biomedical Development and co-Founder. Each VitaminVapor™ lasts between 800 to 1,000 activations, delivering vitamins to the bloodstream immediately, requiring no refilling or recharging. A single VitaminVapor™ retails for $14.95 and is available via inhalehealth.com as well as at Inhale Health's retail gallery located at 136 South Beverly Drive, Beverly Hills, CA, (424) 386 0574. VitaminVapor™ will roll out to retailers nationwide over the next ninety days. Inhale Health™ is a biotech company based in Beverly Hills, California with a mission to advance the world’s healthy habits. Founded by Daniel Wolf and Mario Danek, and incorporated in 2014, Inhale Health is committed to the innovation, design and production of inhalable products that advance health. Inhale Health Introduces VitaminVapor™ to the Health Care Retail Market. VitaminVapor™ Delivers Four Essential B Vitamins Through Inhalation.